April 29, 2015 — Majority state legislative Republicans, led by Assembly Speaker John Hambrick, are moving a bill to change Nevada’s presidential nominating system from a caucus to a primary. A companion measure has been introduced in the state Senate. The initiative, if both houses pass and Gov. Brian Sandoval (R) signs the bill(s) into law, is quite significant considering Nevada is one of just four states the Republican National Committee sanctions for voting prior to March 1, 2016. The measure(s) would schedule the new Republican primary for Tuesday, Feb. 23, 2016, just ahead of the Saturday (Feb. 27, 2016) South Carolina primary and behind the first-in-the-nation New Hampshire primary that is tentatively targeted for Tuesday, Feb. 9. The nation’s first caucus vote, held in Iowa, is scheduled to occur on or around Feb. 1, 2016. The legislators do not appear to be attempting to aid any one particular candidate, though the candidates with more in the way of campaign financial resources should benefit to the detriment of those depending upon a strong grassroots precinct organizations. Rather, their stated goal is to increase voter participation and avoid what state Republican Party chairman Michael McDonald said hurt the state in 2012. Voters go to the polls in Texas tomorrow to choose US Senate as well as several congressional nominees. The big Senate battle is on the Republican side, where three-term Lt. Gov. 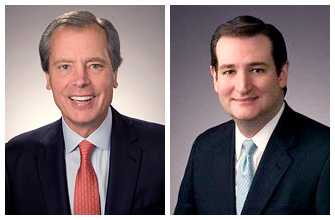 David Dewhurst fights to save his political credibility against former state solicitor general Ted Cruz. In the May 29 primary, Dewhurst placed first with 44.7 percent of the vote versus Cruz’s 34.1 percent. The primary results place Dewhurst in a gray area as to whether he can develop a winning run-off coalition in a two-way race. Most often, a well-known candidate who fails to secure a majority of his own party’s vote in the primary election loses the subsequent run-off because the majority opposition only has one choice. Turnout and the candidate who has the most energized base tend to be the determining factors. Internal polls released from both camps show their own candidate leading in the high single-digit range. The Cruz polling was conducted just among May 29 primary voters while the Dewhurst samples are from a likely voter model. The methodology difference lends more credence to the Cruz polls. The chances of seeing an upset win here are at least 50/50. On the Democrat side, former state Rep. Paul Sadler and retired educator Grady Yarbrough battle for a ticket to the general election. Realistically, the winner of the Dewhurst-Cruz contest easily defeats the Dem winner in November, so tomorrow’s GOP run-off is likely race-determining. On the congressional level, run-off voters in several districts will effectively choose House members. In the Dallas-Ft. Worth area, the 33rd Congressional District is one of four new seats awarded the state. A Democratic battle between Ft. Worth state Rep. Marc Veasey and former state representative and Dallas City Councilman Domingo Garcia is peaking. The race has become a rivalry contest between the two Metroplex cities. With more of the Ft. Worth area included in the new 33rd and placing first with a 37-25 percent margin, Veasey is viewed to be the favorite tomorrow. The Democrat winner claims the seat in November. In the Rio Grande Valley, the new 34th Congressional District is anchored in the city of Brownsville and travels along the Gulf of Mexico coastline. Filemon Vela will likely win the Democratic nomination tomorrow against former congressional aide Denise Saenz Blanchard. Vela, an attorney, is the son of ex-federal judge Filemon B. Vela and former Brownsville mayor Blanca Sanchez Vela. His wife, a Republican, is a sitting district judge. Vela placed first in May with 40 percent of the vote against only 13 percent for Blanchard. The large spread suggests Vela is in strong run-off and general election position. For the Republicans, in the district stretching from the southern tip of Tarrant County (Ft. Worth) into western Travis County (Austin), former Secretary of State Roger Williams, assuming that financial wherewithal is a determining factor, is poised to score a run-off victory against Tea Party activist and college professor Wes Riddle. Williams is projected to outspend Riddle by an 8:1 margin, but the latter should have a grassroots advantage. In a low turnout election, that could be significant but it is unlikely he can overcome Williams’ many advantages. In the state’s fourth new district, the 36th CD to the north and east of Houston, first-place finisher Mark Takach, a financial advisor who placed just 350 votes ahead of former Rep. Steve Stockman in the primary, face each other tomorrow. The outcome here is difficult to predict. Takach is an unknown and Stockman served only one term back in 1995-97 in an adjoining area. The winner, however, becomes the prohibitive favorite for November. In the open 14th District, the seat veteran congressman and presidential candidate Ron Paul is vacating, two strong Republicans, state Rep. Randy Weber and Pearland City Councilwoman Felicia Harris, are fighting for the right to face ex-Rep. Nick Lampson (D) in the general election. The district clearly favors Republicans, but Lampson represented the Beaumont-Galveston region for four terms until his defeat in the redistricted 2nd CD that took him out of his regional base. From the expansive district that stretches from San Antonio all the way to El Paso, another defeated congressman, Ciro Rodriguez, is attempting yet another comeback. He placed first in the May 29 Democrat primary and now faces state Rep. Pete Gallego in tomorrow’s run-off. The Democrat establishment is clearly behind Gallego, who most believe will be the stronger opponent to freshman Republican Rep. Quico Canseco, but the San Antonio base still appears to be a Rodriguez asset. The general election will be a toss-up in what is Texas’ only real marginal congressional district. The delayed Texas primary was finally held last night and featured a voter participation rate of approximately 20 percent. The vote was originally scheduled for March 6, but had to be twice postponed because of litigation over the state’s redistricting maps. In the much-anticipated Republican Senate race, Lt. Gov. David Dewhurst, who began the race as the prohibitive favorite, did in fact place first but fell about four points below the 50 percent threshold necessary to avoid a run-off election. Therefore, he and second-place finisher, former Texas solicitor general Ted Cruz, will square off in a July 31 secondary vote. Placing far behind these two were former Dallas mayor Tom Leppert and ESPN college football analyst Craig James. Leppert and James are eliminated from further competition. Dewhurst was spending wildly at the end of the race in hopes of attaining the majority plateau in order to make an outright claim upon the nomination. Overall, the lieutenant governor’s primary spending will likely top $20 million, of which $12 million came from the candidate himself in the way of a loan. In contrast, Cruz only spent in the neighborhood of $5 million. Forcing Dewhurst into a run-off was Cruz’s only hope at winning the nomination, since it was never feasible he could top the lieutenant governor for first place. In a one-on-one battle where turnout will be even lower than in the primary leads to a political situation where anything can happen. On the Democratic side, former state Rep. Paul Sadler and psychologist Grady Yarbrough will head for a second election. The winner becomes the sacrificial lamb to either Dewhurst or Cruz in the general election. In the district congressional races, it appears, when all of the votes are finally counted and released, that eight-term veteran Rep. Silvestre Reyes (D-TX-16) may have lost the Democratic nomination to former El Paso city councilman Beto O’Rourke. The challenger was hovering around the 51 percent mark, which will be enough to win the nomination outright. Late votes could force a run-off if both fall just below the majority mark. O’Rourke was supported by the Campaign for Primary Accountability, which concentrates on defeating long-term incumbents in both parties. This would be a major upset; Reyes will be the third non-paired incumbent to already lose in his or her own party primary. In other congressional races, Rep. Ralph Hall (R-TX-4), at 89 the oldest member of the House, stared down two GOP opponents to secure renomination. Hall garnered 59 percent against a pair of opponents. In the Dallas area, Rep. Joe Barton (R-TX-6) easily avoided a run-off by scoring 64 percent of the vote against two opponents. Reps. Kenny Marchant (R-TX-24) and Eddie Bernice Johnson (D-TX-30) also easily avoided run-offs against opponents who originally appeared to have the wherewithal to organize credible campaigns. All other incumbents easily won their nomination battles including freshman Rep. Blake Farenthold (R-TX-27) who was a surprise winner in 2010. Because redistricting added 46 percent new voters, most of whom are Republican oriented, Farenthold has a strong chance of keeping this seat the rest of the decade now that he is the bona-fide incumbent in this newly constructed seat. He scored an impressive 80 percent of the vote last night. Rep. Lloyd Doggett (D-TX-25), who redistricting placed in the new heavy Hispanic 35th District between Austin and San Antonio defeated two opponents with 71 percent of the vote. He will now go onto an easy re-election campaign in the fall. In the open seat races, state Rep. Joaquin Castro, who was unopposed for the Democratic nomination in the San Antonio-based 20th District that retiring Rep. Charlie Gonzalez (D) is vacating, took one major step toward winning in the fall as he now becomes the official party standard bearer. He will easily win election in November. In the new 14th CD, the seat presidential candidate Ron Paul is vacating, Republicans will feature a run-off election between state Rep. Randy Weber and Pearland City Councilwoman Felicia Harris. The winner faces former Rep. Nick Lampson (D) in what will be an interesting general election. The eventual Republican nominee should win here, but Lampson has proven strength in the Beaumont-Galveston area. Turning to the four new seats that population growth awarded the state, former Secretary of State Roger Williams placed first in a field of 12 GOP candidates and will now face retired Army officer and Tea Party activist Wes Riddle. The winner of the 25th District Republican run-off, probably Williams, will claim the seat in November. In the new Dallas-Ft. Worth-based 33rd District, as expected, former Dallas city councilman and state representative Domingo Garcia and ex-congressional aide (to then-Rep. Martin Frost, D-TX-24) Marc Veasey will also head to a secondary election, with the latter placing first by more than 10 points. In the Brownsville area in South Texas, attorney Filemon Vela, the son of former US District Judge Filemon Vela, Sr. and Brownsville Mayor Blanca Sanchez Vela, placed first in the 34th District primary. He will face former Edinburg city manager Ramiro Garza. The run-off winner, very likely Vela, takes the seat in November. In the new Republican 36th District, a three-way battle is still being finalized among financial advisor Stephen Takach, former US representative Steve Stockman, and state Sen. Mike Jackson. Takach seems poised to finish first. Because of the outstanding vote in Harris County, the only place Jackson showed real strength, he will probably edge the former congressman for second. The run-off winner claims the seat in November. Turning to the state’s one strong general election challenger race, in the San Antonio-based 23rd District, former Rep. Ciro Rodriguez (D-TX-23) who has won and lost two different House seats, is very close to capturing the outright majority that would clinch yet another party nomination for him. State Rep. Pete Gallego is second hovering in the mid-30s percentile, and he will either lose or barely qualify for a run-off when all ballots are finally counted. The new Democratic nominee will now face freshman Rep. Quico Canseco (R) in the general election. The 23rd is a tight district, so expect a highly competitive race in the fall. Presidential and congressional primaries were held in Arkansas and Kentucky last night without major surprises. As predicted, President Obama won two tepid victories in the pair of states, failing to break 60 percent in either place. He opposed an unknown Democratic candidate in Arkansas and was pitted against an uncommitted slate in Kentucky. John Wolfe Jr., a Chattanooga, Tenn. attorney, scored 42 percent against Obama in the Arkansas Democrat primary. This is the strongest race Wolfe has run. Prior to entering the presidential contest, he twice ran for Congress, and once each for the offices of Tennessee state senator and mayor of Chattanooga. Prior to last night when facing the President of the United States, Wolfe never could top 34 percent in any of his multiple political endeavors. In Kentucky, Obama also scored an anemic 58 percent of the vote. Here, 42 percent of the Blue Grass State’s Democrats chose an uncommitted slate of delegates to go the party’s national convention in Charlotte. The results don’t mean much from a national perspective; only that the president will not be re-elected in a 50-state sweep. This is the second and third primaries where an alternative to Obama received substantial votes. West Virginia was the other state where that occurred. It is unlikely that the President will be competitive in any of these places in November, since better than four of six of his own party’s primary voters failed to support him. In the KY-4 Republican congressional primary race (Rep. Geoff Davis-R, retiring), Lewis County Judge (county executive) and engineer Thomas Massie defeated state Rep. Alecia Webb-Edgington and Boone County Judge Gary Moore. The margin was 45-29-15 percent in what was a poor finish for Moore, who represented more people through his local office than did the other two. It is a boon for the Paul family because both Rep. Ron Paul (R-TX-14) and Sen. Rand Paul (R-KY) endorsed the hard-charging winner. All three of the candidates were approaching financial parity. The Republican nature of the district means that Massie will be the new congressman. He faces Grant County Democratic Chairman Bill Adkins in the fall and what stands to be a non-competitive election. The closest race of the evening was in Arkansas’ 1st Congressional District where Second Circuit Prosecuting Attorney Scott Ellington came within less than one point of winning the Democratic nomination outright. He will face state Rep. and Marvell ex-mayor Clark Hall in a June 12 secondary vote. The winner will oppose freshman Rep. Rick Crawford (R) in a newly configured 1st District that now has an even higher Democratic baseline than under the current lines, though President Obama could only score 39 percent under each version. This could become a competitive general election battle. In the south-central 4th District, polling correctly suggested another outcome, as Afghan War veteran and businessman Tom Cotton, who raised more than $1 million for the primary campaign, won the Republican nomination outright with an impressive 57-37 percent win over 2010 congressional nominee and former Miss Arkansas Beth Anne Rankin. Cotton must now wait until June 12 to see if he will face state Sen. Gene Jeffress or attorney Byrum Hurst, the latter of whom, as the underdog, made a very strong run for the top spot. At the end of the evening, Jeffress totaled 40 percent to Hurst’s 36 percent. While the 1st District race could be headed to toss-up territory, Cotton figures to be the 4th District general election favorite. AR-4 is a Republican conversion seat because Rep. Mike Ross (D), a Blue Dog Coalition co-chairman, is retiring.